On November 11, at the Budokan in Naha, at his second special public talk in Okinawa, the 14th Dalai Lama stressed the importance of dialogue for mutual understanding. 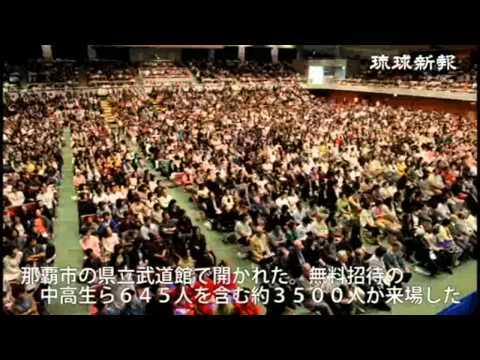 On November 11, at the Budokan in Naha, the supreme leader of Tibetan Buddhism, the 14th Dalai Lama gave a public talk on “The Strength to Overcome Difficulties and Talk to the Future Younger Generation.” It was attended by about 3500 people, including 645 high school and junior high school students who came free of charge. During his talk, he reflected on the 20th century as a century of violence and bloodshed, in which over 200 million people died as a result of war. “In order to make the 21st century a better era, we need to practice nonviolence, and we need to make an effort to achieve peace through dialogue which facilitates mutual respect and understanding.” He encouraged the younger generation to strive for a better and brighter future. 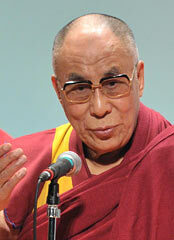 The Dalai Lama said, “The past only lives in our memories and it is no use worrying about what has already happened. The future depends on what’s happening now.” He also mentioned the destructive emotions, such as anger, hatred, jealousy and fear, which create a barrier between “us” and “them,” and that self-centered thinking originates from that barrier. “When we wish for other people to be happy and take responsibility for that, those destructive emotions will be transformed.” This was his second visit in Okinawa after the first in 2009. On the same day, he also visited Konpaku-no-To Memorial, the site of a Bodhi Tree as well as Himeyuri-no-To and the Himeyuri Peace Museum in Itoman.